The laboratory analysis also measured the Oxygen Radical Absorbance Capacity (ORAC) of borojo. 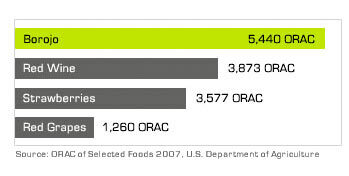 ORAC is a measure of the antioxidant capacity of food, with higher values indicating superior antioxidant capabilities. Antioxidants are critical for health because they neutralize free radicals, thus helping to prevent cell and tissue damage that could lead to cellular degeneration and disease. The analysis found that borojo has an ORAC value of over 5,400 (μmolTE/100 g), which exceeds the ORAC of most fruits and vegetables. This finding wasn't surprising given the high levels of antioxidant polyphenols that were discovered in the Rutgers University study. 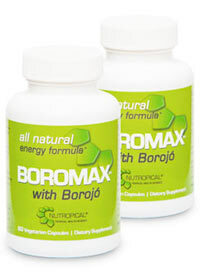 Overall, borojo seems to function through the combined benefits of polyphenol antioxidants, essential amino acids and macro minerals.